About 15 km outside Lonavla, just off the Mumbai - Pune Road, there are several Buddhist rock-cut caves worth visiting and Bhaja Caves are one among them. Dating back to the 2nd Century BC, the monuments at Bhaja are renowned for its ancient Buddhist Rock cut Architecture. The caves are maintained by the Archaeological Survey of India. Bhaja Caves are worth spending a weekend. Situated amidst a range of hills, these were excavated by the Buddhist monks, who used to gather here during the monsoons. It is situated in the cliffs opposite Karla Caves. Situated in Aurangabad District, it is about 120 km from Mumbai and 40 km from the city of Pune. The two other main hillstations i.e Khandala and Matheran are located near to these caves. Karla and Bedsa caves are also very near to Bhaja. The Bhaja cave excavations are developed over two periods - from the 2nd century BC Satavahana period to the 2nd century AD, and from the 5th century AD to the 10th century AD, making them among the earliest rock - cut monuments in Maharashtra. It was started by the Hinayana Buddhists and were later taken over, by the Mahayana sect. The Bhaja caves share the same set of architectural designs as Karla caves but it's architecture is better preserved than Karla Caves. The main feature of the Bhaja caves is the setting of the cave site. Set amidst imposing hill range, that the rays of the setting sun enters insides of the caves. Bhaja Caves are a group of 22 rock-cut caves and most of the 20 caves here have a verandah and hall with small cells provided by benches. Out of the 22 rock-cut caves, the first cave is the residential place of the master of the caves. The next ten are the Buddhist viharas, out of which one cave is the Chaitya Hall (Chaityagriha) with unique reliefs of Indian mythology. The other seven caves have a nave and aisle with an apse containing a solid stupa and inscriptions, which include the details of the patron. Total, there are 12 inscriptions. The stupas and viharas are adorned with intricate designs and paintings. 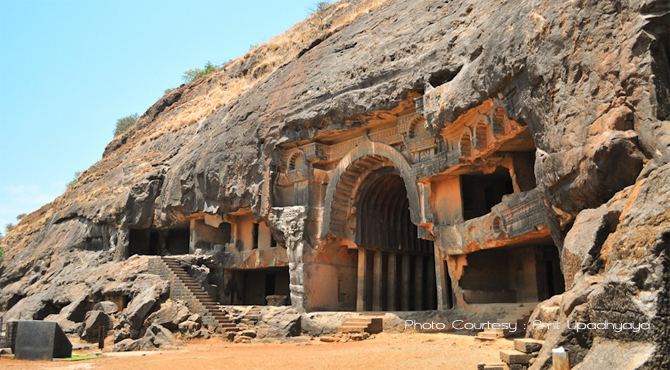 The 12th and the largest and the most impressive Bhaja caves. It consists of a hall where prayers used to be conducted and this cave is known for its superb art and architecture. This is the most photographed caves in region. Also one of the earliest large Chiatya Caves. The interior is divided into three aislesby octagonal columns. Cave No.18. contains some of the most interesting sculptural groups in Bhaja. It is in south approached through a columned verandah. The doors are flanked by guardian figures. The interior of the hall has four side cells with doorways framed by horsehoe-arched motifs. The left panel depicts a royal person with two woman attendants, driving an aerial chariot..
Additional beauty to this area is added by a waterfall, which ends in a small pond. It is located south from the caves and has water only monsoon period. Entry fee : Rs 5 for Indians and Rs 10 for foreigners.